I'm back again today for day 2 of THE GREETING FARM august previews, and i would like you to meet OLIVER from the new Oliver and Amelia Birthday Set. Isn't he handsome in his cute little vest, with his gorgeous red hair. As you may know, i don't very often make boys cards, so i had to sit on my hands so as not to add any more embellishments! That's all for me for today. Make sure you check out all the other DT blogs, and you may just find Oliver's little friend Amelia. And don't forget to pop back on Monday. Our Third Birthday Blog Hop will be kicking off at 12.01am CST, (or for those of you in Australia, 3.01 pm Monday), for more previews, more fun, and of course, giveaways. See you then. We are SUPER excited to cordially invite you to TGF's THIRD Birthday bash/Blog Hop! Can you BELIEVE the Farm is turning three? We can't, and it wouldn't be a party without you, so please join us for a CELEBRATORY release! Aren't they so amazingly CUTE! They look so perfect together that i had to put them BOTH on the one card. I've made a "step" card for the first time, and they suited the card perfectly. Here's a close-up of Anya, and her scrumptious chocolate cupcake. Yum! These little cuties are two of THREE new releases, to celebrate THREE years! And what's more? There will be THREE grand prize winners! That is right! Just for hoppin' with the Farm on our THIRD birthday, THREE lucky commenters will be chosen to win the ENTIRE RELEASE! We are SO excited! That's it for me today, but I'll be back tomorrow with another birthday SURPRISE! Save the date and see ya tomorrow! I have tried a few different things this time. I airbrushed red onto my pink scalloped cardstock rectangle, and was really pleased with the effect. I paperpieced her dress with a scrap of patterned paper, and i have started photographing the copic colors i have used as i photograph each card. I'm not very computer savvy so this saves me LOTS of time. Could you imagine me sitting here typing every color with only my index finger? LOL. Having said that, i can't remember the last time i only used 15 colors on an image. My average would be closer to 25 per card. You know, that's what paper piecing does. Less coloring time...Quicker cards. Well, that's all for today. I can hear work calling. Today is Thursday Throwback day over at The Greeting Farm. It's my turn to showcase an older TGF stamp, and i chose Wild Sprout Dahlia. Isn't she just adorable. For my full post pop on over to the TGF BLOG and check it out. Well, we had a family gathering yesterday to farewell Annabel.She leaves tomorrow morning to live on a remote island (called King Island) in the middle of Bass Strait for the whole of term 3. I think i mentioned that i made her a journal to take with her. They're not allowed to take anything electronic, including phones, ipods, laptops, ipads, hairdriers, hairstraighteners, etc, etc. So hopefully she'll write us lots of letters. Once again, thank you to my friend Eb for the inspiration. Wish me luck for tomorrow's goodbye. 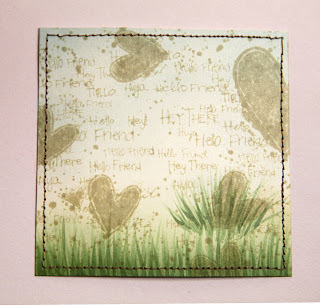 I'm thinking, seeing as i used all my greeting farm background stamps, cloud stamp, piper, and washi tape from TGF, that maybe i should put a little sign on the door that says "the greeting farm" or maybe just the initials TGF. I think i'm meant to sign it as well. oops! I decided to try mod podging over the top of piper and thank goodness all was good. I had visions of all my copic coloring mixing into one ugly mess but luckily that didn't happen. So, i hope you like my creation. I have since made the covers of a journal for DD#1 to take with her to King Island for ALL OF NEXT TERM. She is only 15 and spends the entire school term on a tiny island in Bass Strait.....in the middle of Winter!!! Can't show the journal yet though, as she may read my blog. Off to bake and decorate a cake for Annabel's farewell party on Sunday. A big Aussie G'DAY today from FARMER TRACEY. That's the only time you'll ever hear me say that though, as it's kind of slang, and not really part of my vocabulary. Firstly, i'd like to say a great big thank-you to all of you lovely ladies for such a warm welcome to THE GREETING FARM. I've thoroughly enjoyed every single minute of my first two weeks at the farm, especially all the kind comments on both my own blog and also right here on The Greeting Farm blog. Don't you just love all the new stamps for July. They are all so divine, I couldn't possibly choose one favorite. As it is my turn in the spotlight this week, and the fact that i'm a new farmer, I thought I would start by sharing a little about myself. I am a Mum to 4 gorgeous daughters ranging in age from 9 to 15, and have the most awesome husband in the world. I retired from work as a medical doctor 9 years ago in order to concentrate on raising our family, and went on to discover scrapbooking 5 years ago, which led to me opening my very own scrapbooking and cardmaking store a little over 3 years ago. I was a serious scrapbooker to begin with, and didn't even like stamping until I discovered copic markers 12 months ago. Now i am totally addicted to rubber, ink and copics. Rarely does a day pass without a marker in my hand, and i can say i truly am blessed to be able to combine my hobby with my job. One of my favorite tools at the moment is my airbrush and air compressor. I use it on most cards, even if just for a little edging. So, i thought i would show you step by step how i make the background that i then use to put a colored TGF image on for my cards. 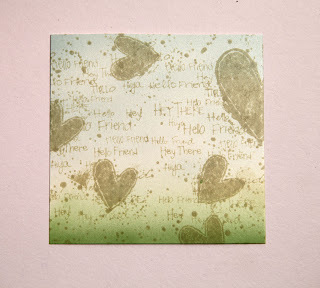 For this card I have used BLUSH SOCIETY BONNIE, with all of my favorite background stamps, splotchy, hello and hearts. I started by coloring in Bonnie, and cutting her out using my cutterbee scissors. I then took a plain piece of cryogen white cardstock, ready to design my custom background. First i stamped my background stamps randomly over the entire card. 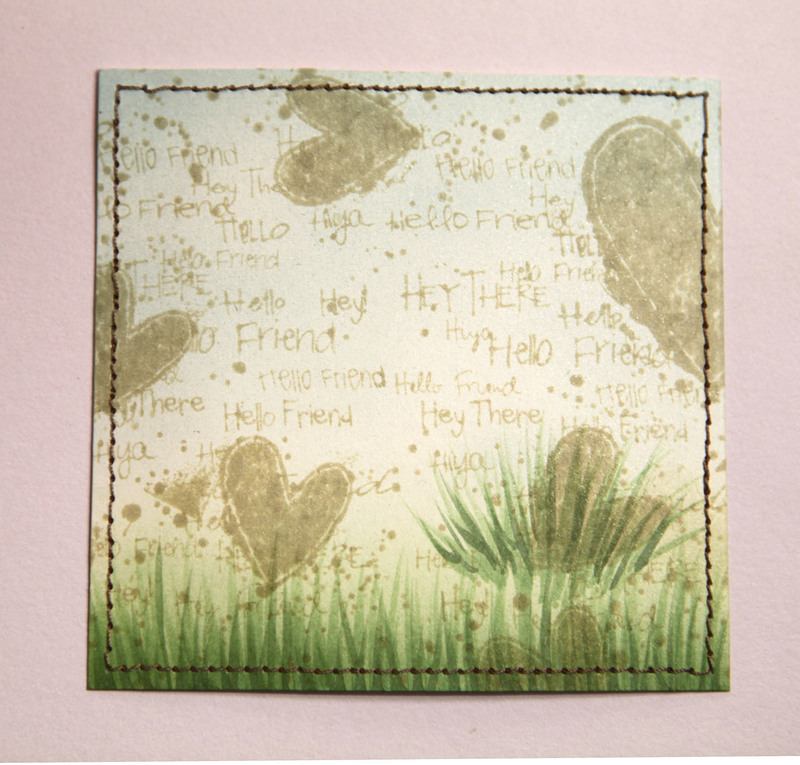 I used old paper distress ink. Then, I used my airbrush, with BG70, BG72, G82 and G94,(in that order), to add sky and grass to the background. As a final touch, I hand drew some blades of grass using a flicking motion in G82 and G94. Then I decided that I would have to add an extra "bunch" of grass for Bonnie to stand on so that she looked grounded. I also ran around the edge on the sewing machine to border the background scene. So there you have it. Some flowers, leaves, flourishes and ribbons and you're done. I hope you liked my first Greeting Farm post. See you soon with another Greeting Farm project. Today i would like to introduce the cutest little boy, OLIVER, from the Greeting Farm. He's all ready for some Summer fun, complete with snorkle, goggles and boardies. I have colored him to match Summer Fun Amelia, who i introduced last week during TGF preview week. Hopefully you'll notice that the photo of Oliver looks way nicer than Amelia's photo. Well, i've followed all Jen's tips over at TGF on "how to photograph cards indoors" and look at the amazing difference that following her advice has made. I thoroughly recommend that you check out her post. I've been working on some canvases over the past few days and i am loving getting messy with stamps and paints. Can't wait to share, but off to create more now. I don't usually enter many challenges, but i had a stampavie image that i had colored some time ago, and had absolutely no idea what i was going to do with it. Then i discovered jen shults' blog and decided to use this weeks sketch DS8 to jump start my creativity. And it did just that. Here's my card. Boy cards really aren't my thing, but i was actually quite pleased with this one in the end. Thanks Jen for the sketch inspiration. I had a very creative day today. DH took all four girlies on a day trip to Melbourne to go ice-skating, which they all LOVED. That left me to scrap all day. I did make the hungry skaters roast for dinner though, so everyone was happy. I'll save some more pics for another day. ....and of course, you know what that means! The BIGGER the release? The BIGGER the prize! Can you believe that ONE lucky winner will take home ALL SIX of the new stamps...the ENTIRE July release! That's one BIG prize! What's more? Well, we are SO excited about our July stamps that we didn't want to stop there! IN ADDITION, one lucky winner will ALSO be randomly chosen to take home the new Blush Society line, that's 4 stamps in all for this month! Both winners will be drawn as a result of completing the Blog Hop and going back to the TGF Blog to leave a comment...so be sure you get your entry in....and hey! Who DOESN'T love a bunch of amazing inspiration on the way! I used BLUSH BABETTE, and the very versatile sentiment stamp that comes with her, "just because". I have colored her with Copics to match Basic Grey's new range of papers. I hope you like my blog hop card. back to TGF Blog to leave your comment to WIN! Thanks so much for the awesome welcome as a new TGF Farmer this past week. I can't believe we're already through with our first week of previews and I'll be seeing you VERY soon around blog land. Good luck to all who enter and ENJOY the JULY RELEASE atThe Greeting Farm!